I strongly believe that one of the most important—and under appreciated—aspects of operating a successful hotel is the food-and-beverage component. This is a conclusion I have reached largely as a result of the efforts and innovations of Steve Smith, one of our principals and a lifelong F&B professional. 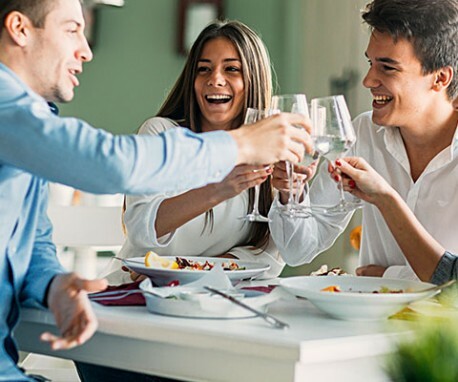 Steve recently shared with me some interesting insights into ways that savvy hoteliers can structure the F&B component of their hotels to optimize efficiency, maximize profits and enhance the overall success of their property. Many hotel investors labor under the false impression that F&B is, at best, a loss leader, or believe that establishing a strong F&B component is all about having a marquee restaurant. In reality, a winning investment must satisfy both hotel and local guest needs with a design that complements hotel operations. We characteristically generate a 25% to 45% departmental profit in the F&B department, with the main variable being the size of the catering operation. That’s not to say a quality restaurant operation won’t enhance your hotel, both financially and from a public relations perspective, but it is often a high-risk and low-return proposition. You have to be confident you are in the right location and have the right space in your hotel to minimize the risk. To increase your margins, focus on banquets and the bar. The way you create a profitable and sustainable F&B component is not typically about a celebrity chef or a posh restaurant. It is about space, structure and strategy. When working with a property that requires a renovation or reconfiguration, the first thing to do is to evaluate the space. Is it structured in a way that it can be leased? When leasing, you never want to give up control of the banquet/catering business or breakfast. Breakfast is an extension of your guest experience, which relates back to your main profit center: the hotel. And you don’t want to give up catering because that affects your group business, which is a critical source of profits. The reality is that most of the time a lease will not be a viable option. Typically there is not enough space, or the logistics are not feasible. Frequently, a successful F&B approach means moving away from the large restaurant concept and instead maximizing ballroom and banquet space. Recent hotel trends have focused on open lobby concepts, with a lobby bar and a modest amount of open restaurant space. Often, this provides an opportunity to create additional banquet and ballroom areas—space that will make it possible for you to book more special events such as weddings, Bar and Bat Mitzvahs, corporate group events, reunions, etc. Never lose sight of the fact that your main profit center is the hotel proper, so your priority should be filling guest rooms. Banquet facilities contribute to that goal, with the added advantage of great profit margins. At an oceanfront hotel in North Carolina we had the opportunity, after a hurricane, to reconfigure a much-too-large 180-seat restaurant into a 40-seat restaurant with an oceanfront ballroom. Sales and profitability increased significantly while also delivering an improved dining experience for our guests. To hit those high profit margins, you have to protect your prime costs: food, bar and labor. Labor is the most significant, which means that there is a direct correlation between the functional efficiency of your design and your costs. F&B labor costs are all about “steps.” Whether it’s steps from a guest table to the bar, steps from the kitchen to the host stand or steps to the walk-in cooler from the server station, each step an employee takes has a cost. The more you can reduce those steps, the more money you save. Creating efficiencies so you can reduce your labor costs often means pushing back against unproductive or shortsighted design concepts. In a renovation, generally what happens is that architects and designers get control of the public space, and they are designing to make it look appealing, to meet the brand standard and to make the owners happy. They simply do not have the requisite F&B experience to design an efficient layout. Make sure your F&B team gives its input prior to final design approval. A simple bar renovation that results in an ill-conceived and inefficient design can cost your bottom line hundreds of thousands of dollars in lost productivity and labor over the life of the asset. For example, one of the F&B trends we are embracing is the use of programmable ovens either on or near the bar. This one small step can have an enormous impact on reduced labor costs. These ovens allow the bartender to provide late-night guests with hot food (typically a small menu of small plates and appetizers already prepped by the kitchen staff) after the kitchen closes down. This provides management with the flexibility to reduce expensive kitchen labor costs while maintaining a high-quality product and still providing proficient service to guests. One critically important mechanism to control your two other prime expenses—food and bar costs—is to focus on implementing the right point-of-sale system. Instead of an add-on to the hotel POS system, consider looking at a restaurant POS system. The best platforms can not only interface perfectly well with the hotel system (for room charges and other coordination needs), but also provide the added advantage of improved service speed, increased sales and reduced training. In addition, the enhanced operational controls provide superior performance metrics and generate alerts that include actionable data and history to prevent fraud. There are dozens of ways to steal through a cash register system in a restaurant. With the right system, any suspicious activity gets tracked, and a report of that activity is generated every morning for management review. When it comes to profitable F&B operations, always keep in mind how to deliver your product most efficiently, whether that be in the design of the space or the design of the menu. If your restaurant is primarily there to serve your hotel guests, do fewer things well. For instance, limit your menu and feature daily specials for variety and regional flair, and/or consider combining roles such as a chef who also handles the F&B director responsibilities. Focus your energy on the most profitable areas: bar and banquet sales. The bottom line is that F&B does not have to be a loss leader. It can and should be successful and profitable, and it should be designed to complement the hotel. With the right layout and the right operational tweaks, it will achieve your goals.